Newly signed HB 1508 creates a Breakfast after the Bell program for high poverty schools. HB1508, Breakfast after the Bell, was signed by Governor Jay Inslee on March 7 at 1:30 pm in the Governor’s conference room. In attendance were bill sponsors, advocates and students. The bill was one of WSPTA’s top 5 list for 2017 and 2018 legislative priorities. 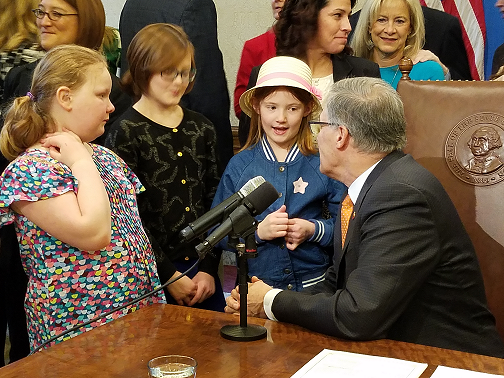 Governor Jay Inslee took time to chat with the daughters of Heather Lindberg, Vancouver parent and WSPTA lead for Breakfast after the Bell, at the bill signing ceremony.